‘Best of ‘ anthology from one of the leading lights of the Philly Sound, Billy Paul, with selections from the albums recorded during his prime years 1969 to 1985. Ian Canty looks at a performer with a deep sense of social consciousness who seasoned his love songs with protest material including the “other” song he’s most known for: Am I Black Enough For You? Billy Paul had the kind of voice that seemed just made for the lush Gamble And Huff creations that defined the legendary Philadelphia Sound, but he was in truth a jazz singer. In the excellent documentary film Am I Black Enough For You? which profiled Paul, I think it was Questlove from the Roots who put his finger on the key to Paul’s success. If I remember correctly he sagely observed that Paul’s mastery and control of his voice, the result of his training in the jazz field, gave him an advantage over those who came through the R&B route. He conquered that Soul field in those pre-Disco days, racking up 13 chart singles in the US including number one hit Me And Mrs Jones. The story of an assignation with a married lover, Paul’s sweet delivery meant it was never salacious, ably communicating genuine emotion rather than lust. Perfect song-storytelling and jaw-dropping execution, it went down a storm and launched Billy’s career, even though he had been plugging away for 20 years before he cut the record. A member of an early line up of Harold Melvin And The Blue Notes, he cut two singles way back in the early 1950s for the Jubilee label. Becoming a fixture at Philly’s jazz haunts, he recorded his first album Feelin’ Good At The Cadillac Club, which was financed by his wife Blanche’s savings. Whilst recording, he met Kenny Gamble, who persuaded him to sign to the record label he was putting together. So the record was released on Gamble Records and along with Leon Huff, Gamble would go on to play a huge role in Billy Paul’s success with their subsequent imprint Philadelphia International. This anthology of his work during his golden period of success splits a disc each for his “message” songs that delved deep into civil rights activism and the more standard love ballads that he was a dab hand at delivering. The “message” songs disc kicks things off with Paul’s grandstanding version of Elton John’s Your Song, not so much a cover, more just playing around with the theme. He took it to a new level with a ton of energy. The militant message of Am I Black Enough For You was the follow up to Me And Mrs Jones, an intense and funky street jam that deserved much more success than it received. Radio play was predictably sparse in the States and the record only got to 79 on the charts. Coming after Me And Mrs Jones topped the listings, this was a big setback and Paul was critical of the decision to use the record as a follow-up, but over the years his stance seemed to mellow on it. It was, after all, a great record. Now you may have heard enough of Paul’s version of Wings’ Let ‘Em In on that advert, but there’s no doubt he does a good job. How Good Is Your Game presses all the right jazz/funk disco buttons and People Power is one cool unity anthem. Billy Paul always sang with such authority: it made me listen, for one. It is fitting that this disc ends on the positive and upbeat New Day, New World Comin’: a great horn section and guitar plus Billy’s always immaculate work. The message stands the test of time…..the world is ours to change now. The second disc or the “love” songs selection takes us right back to what brought Billy to the table in the first place i.e. his jazz roots. Always more than at home with an emotional slowie, This Is Your Life, Ebony Woman and Let’s Fall In Love All Over Again are excellent examples of ultra-lush jazz balladry, perfect for those smoky late night scenes. Of course, we get “the hit”, perhaps it has been overplayed, but there is no doubting the class on show. Paul could judge the mood of a piece perfectly as demonstrated on the high class orchestrated soul of When Love Is New. Philadelphia International was at its height at the time, just before the disco boom that their crafted productions pioneered and Billy Paul was flying high. Billy shows his slow-jam prowess on the calm and mellow Billy’s Back Home (penned by Dexter Wansel), while I Trust You benefits from some great female backing vocals and delicately plucked acoustic guitar. The last three tunes here date from the 1985 album Lately, cut for the Total Experience label after he split from Philly International in 1980. His penultimate long player, it does have a few of the 80s electronic quirks which rather date the material, but the title track goes right back to Paul’s silky jazz days, complete with talkover intro. It ends with Sexual Therapy, a kind of tribute to the late Marvin Gaye and his Sexual Healing song. This one is full of electro funk riffing and a pretty feisty way to leave the set as a whole. 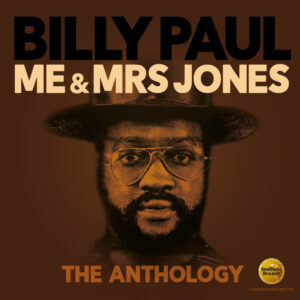 Though Billy Paul had a renaissance after the Am I Black Enough film in 2009 put him back in the public eye (beforehand he officially retired via a stage announcement in 1989, but returned to gigging in the intervening years), he did not record, with his last album being Wide Open released in 1988. He did tour to much acclaim and satisfied audiences but sadly died in 2016 at the age of 81. This new set shows the depth and skill he possessed as a singer and the two sides he presented on the record. Although he did not write the “message” songs, he clearly believed in what he sang and wanted to correct the wrongs with regard to civil rights that had marked his upbringing. His love songs were perfection in aural form and the feelgood and positive message of his music lives on with this well-compiled and annotated new set. You can find Soul Music Records on Facebook and Twitter.